This book, both a monograph and a graduate textbook, is based on my original research and partly on the materials prepared earlier for the 2007 and 2008 IARS Astrophysics Summer School in Istanbul, AstroMundus course 'Supernovae and Their Remnants' that was held for the first time in 2011 at the Department of Astronomy, Faculty of Mathematics, University of Belgrade, and a graduate course 'Evolution of Supernova Remnants' that I teach at the aforementioned university. 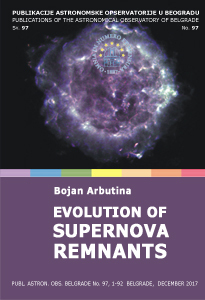 The first part Supernovae (introduction, thermonuclear supernovae, core-collapse supernovae) provides introductory information and explains the classification and physics of supernova explosions, while the second part Supernova remnants (introduction, shock waves, cosmic rays and particle acceleration, magnetic fields, synchrotron radiation, hydrodynamic and radio evolution of supernova remnants), which is the field I work in, is more detailed in scope i.e. technical/mathematical. Special attention is paid to details of mathematical derivations that often cannot be found in original works or available literature. Therefore, I believe it can be useful to both, graduate students and researchers interested in the field.